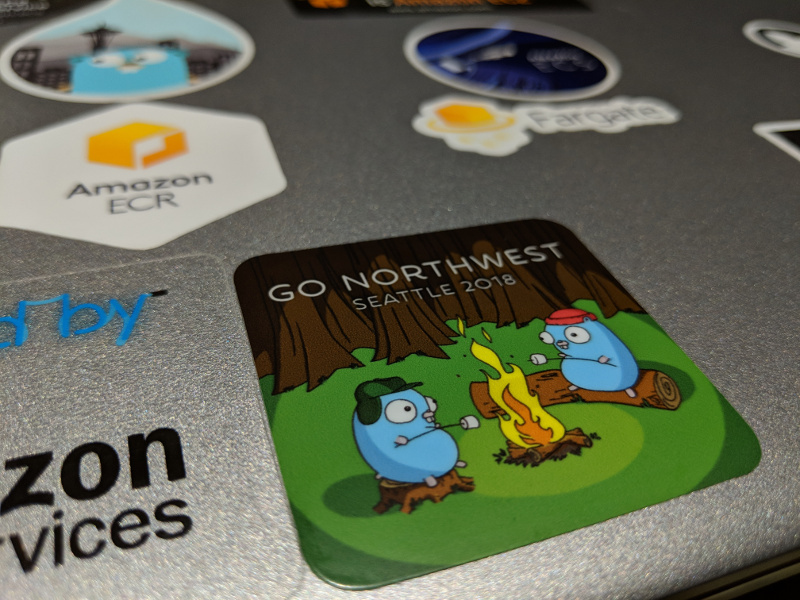 In 2018, I helped organize and run the first-ever “Go Northwest” community conference for Gophers (enthusiasts of the Go programming language) in the Pacific Northwest (Seattle, Vancouver, Portland, etc), along with Ryan Cox, Brittany Walentin, Jake Sanders, Yves Junqueria, and Tiffany Jernigan. 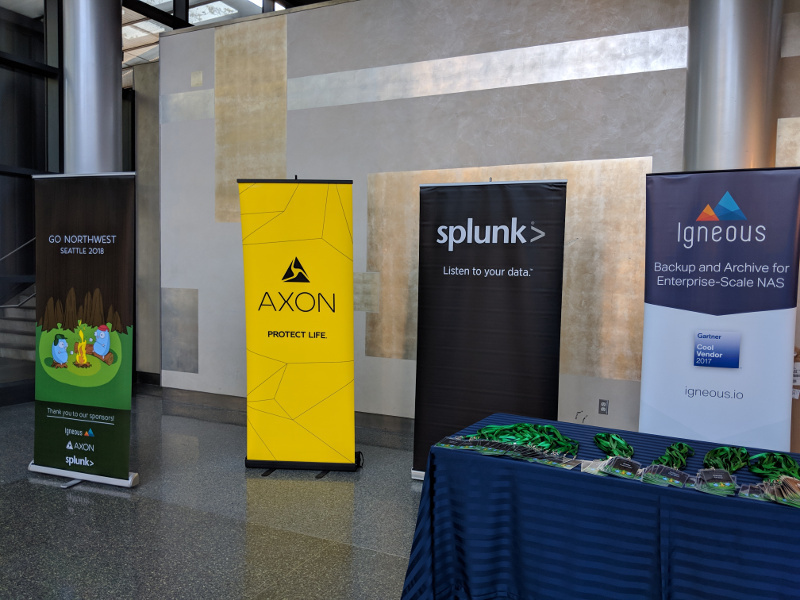 I think the conference was pretty successful, with 280 attendees and 14 speakers and great feedback on the survey we sent to the attendees. It was a really fun experience for me, and I’d like to share my retrospective (which is, admittedly, written a little late). In 2016 and 2017, I attended a few Seattle Go meetups. The meetup was pretty popular, and it drew a reasonably consistent crowd. 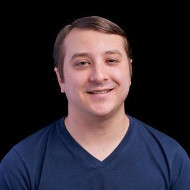 I met Ryan there (he was organizing the meetup) and he started talking about running a larger-format version of the meetup. I volunteered to help, and Ryan introduced me to the other volunteers. This eventually became Go Northwest. Our goal was to run a small, single-day, single-track, community-oriented conference. We wanted to focus on Go and Go-related technologies, to emphasize community (and to de-emphasize vendors trying to sell a product), to be inclusive of Gophers of all experiences, backgrounds, genders, sexual orientations, employment status, and so forth; basically, anyone who would be interested. We set out and divided up responsibilities; Ryan led and I ended up jumping in wherever was needed. We all participated in large parts of the process: date and venue selection, figuring out where the money would be best spent, speaker selection, diversity scholarship decisions, and in running the conference. My individual responsibilities included early budgeting, designing the intake form and processing diversity scholarship applications, worrying about accessibility, and just generally filling in any gaps. Let’s break it down into some different sections. When we started planning the conference, we wanted to make the tickets relatively inexpensive. We decided on a rough cost of $100, and then needed to make up the rest of the budget in sponsorships. My initial budget was a bit naive, and focused mostly on the costs we knew to expect like venue rental. The actual costs were a bit more varied, and we were fortunate that we did not run into any serious financial difficulties for the conference. 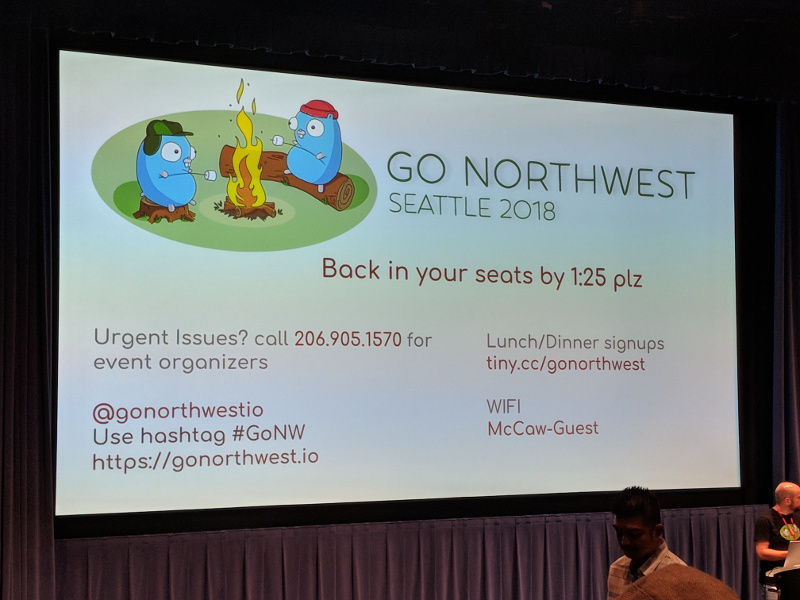 We wanted Go Northwest to be a diverse and inclusive conference. We had a few initiatives to try and meet this goal: reaching out to under-represented groups (like Women Who Go, HERE Seattle, Systers, and others), offering a scholarship for attendees who needed help attending, and ensuring that we had accessibility considerations available on-site. We used PaperCall to collect submissions, and used its blind submission process for our initial review and rating. After we had reviewed, rated, and discussed all the talks, we were pleased to discover that many of the highest-quality submissions were from traditionally under-represented groups. We selected our final slate (after the initial review) with the knowledge of who the speakers were as we specifically wanted to ensure that we were able to include speakers from diverse backgrounds. In terms of content, we wanted to be sure to include attendees across a range of experience levels. We selected talks that were very beginner-oriented, along with talks that were deeper, like language interoperability with C. I think we struck a pretty good balance here, though we did get feedback from some attendees that they would have preferred a “beginner” track and an “advanced” track. We knew that we wanted to offer a scholarship for people who could not otherwise attend the conference. We asked applicants how the scholarship would help them, what specific needs they had, and offered space for them to tell us about themselves. Most applicants were local, though we did have a few apply from other places in the United States as well as from other countries. Although we did extend a number of diversity scholarships, I think our planning here should be better next time. We didn’t have enough reach-out; we only advertised the scholarships on Twitter and through meetup groups, but we believe that more people could have applied and attended who never saw the offer. We did extend complimentary admission to most of the applicants (pretty much anyone who had need and was located in the Pacific Northwest), but that’s about all we did; we did not have sufficient planning in our budget to cover travel stipends or missed-work stipends. We were pretty surprised by the applicants who were from far-flung locations in the US (like Texas or Florida) and we were even more surprised by some applicants from countries on other continents; we had not planned on funding travel from such far locations. We also wanted to make the conference accessible. The venue we picked (McCaw Hall at Seattle Center) was ADA-compliant wheelchair-accessible. They also were able to provide assistive listening devices for those who have impaired hearing. However, we knew that might not be enough for those who have either impaired hearing or auditory processing difficulties, so we also hired a live captioning company (White Coat Captioning). 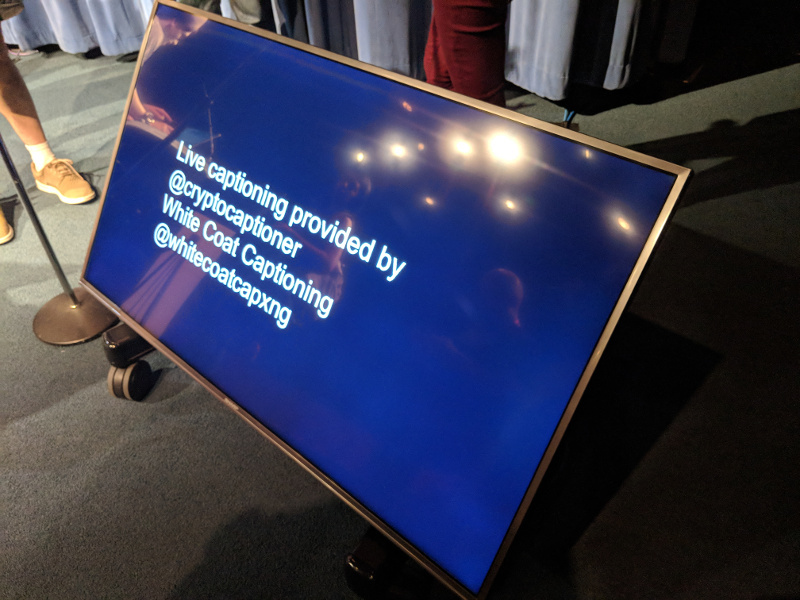 Live captioning was well-received by the audience; the captioner was able to keep up with some impressively fast speaking and good accuracy on technical terminology. The captioning company also delivered the captions as files which we were able to later use for our YouTube recordings. I didn’t help much with marketing the conference, but I did end up helping to run the Twitter account during the conference. I wanted the account to be positive and engaging, sharing some of the content of the talks as well as reactions from attendees. We set up the account to follow all of the speakers and organizers, and during the conference I was looking at related hashtags and search result pages in order to find content to amplify. During the talks, I was able to take some pictures with my phone and post those as well. Ahead of the conference, I think most of the marketing centered around reaching out to various meetup groups and Twitter. We bought some Twitter advertising, but didn’t really find that it converted to actual ticket sales. After the conference, I helped to run attendee surveys to see what everyone thought of the conference and of the speakers. We did get some great feedback for the conference, and mostly there was good feedback for the speakers. Some of the themes of feedback where we can improve the next time is better organization around lunch plans for attendees (not everyone knows the area and we hadn’t made it super easy to meet up with others or find restaurants), making the breaks longer/less hectic for grabbing coffee, and that the 10-minute lightning talks were too short. For a bunch of first-time conference organizers, I think a lot of things worked really well. The highlights for me were the submissions, making the conference diverse and inclusive, and hearing from attendees. The submissions were great. We had a ton of them, they came from people with pretty dramatically different experience levels, they covered interesting topics, and the submitters included a good number of traditionally under-represented groups. The diversity of submissions meant our outreach for soliciting submissions worked pretty well. We did have a tough time selecting a final slate, but some were pretty easy for us to agree to eliminate and I liked that we (the organizers) were pretty well aligned on it (specifically: a number of submissions were barely related to Go and didn’t really fit the theme of our conference). I really liked how everyone was on-board with making the conference diverse and inclusive, thought I do think we can do better here as well. We had a diversity scholarship with a bunch of applicants (good!) but didn’t have a clear set of criteria going in or a clear set of financial allocations (bad!). We had some accessibility considerations on-hand like captioning and assistive listening devices (good! ), but we didn’t have any knowledge of gaps in accessibility (bad!). And I think attendees really enjoyed the conference, at least from the feedback I heard during the conference as well as the survey feedback. It’s certainly gratifying as a conference organizer to hear that people enjoyed it. Of course, there were things that didn’t work as well. The big one for me is comamunication between the organizers; I believe that the other challenges we had stemmed from that. Specifically, it took us a long time to figure out how to divide up tasks, and that meant that Ryan (willingly!) bore the brunt of the work. We didn’t set up a regular cadence for meetings, and that hindered us each understanding the status of everyone else. We used Slack and Trello to some effect, but since organizing the conference was never anyone’s primary job, it would receive less attention. Similarly, we didn’t really get very organized about finances. I had prepared an initial budget, but we strayed from my initial proposal (which had a much more complicated sponsorship structure) and ended up winging it a bit. I’m glad that it worked out well, but I think next time that there’s an opportunity to improve here. Other than planning, themes in the feedback from attendees covered things like needing better refreshments at breaks (or at least more stations so the lines would be shorter), better ways for attendees to meet up and self-organize lunch, the availability of some swag (like t-shirts) for purchase, and potentially changing up the ordering of talks so they’re a bit more grouped by target audience (i.e., group the beginner-oriented talks together). The things that went well (above) can always be improved too; as I mentioned before, I’d like to get better at making the conference more inclusive and more accessible. Hopefully this wasn’t too much word-vomit for you. Let me know what you think in the comments below! And if you want more information, you can check out the conference website, the Twitter account, or the YouTube channel. © Samuel Karp, All Rights Reserved.